By the time we had packed the bike, instructed the neighbour on the finer points of duck husbandry and said goobye to the cats it was 11.30 before we got away. The day was fine and sunny and we made our way through Drouin to the Princess Hwy. Our plan was to make it to Orbost for the evening and after a quick lunch in Traralgon we were on our way and on schedule. We made it through to Orbost via Bruthen and checked into our motel. Fortunately we planned an early dinner, as we later found that all of Orbost closes at about 8pm. 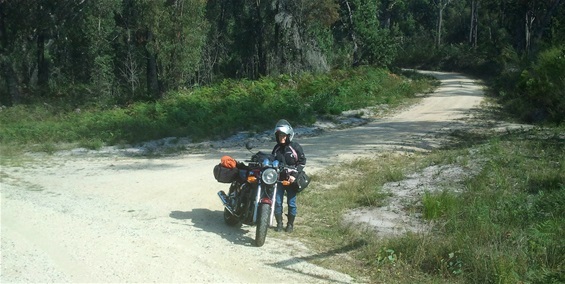 The next day we saddled up and headed for breakfast in Cann River. The weather was almost perfect for riding and we made it to Cobargo easily for lunch and then on to Bermagui. Dinner that night was at Jim and Janes home where we met up with Steve, Rowan, Angelo and Tony who had ridden up from the Peninsula that day. The BBQ and a few ales on deck went down very well. Thanks to Jim and Jane for their hospitality. The next day we met for breakfast in Bermagui and then on to the bike show. The Kingies had done a fantastic job in bringing it all together and the show was excellent. Later on that day the Hermits went for a ride to Tilba Tilba and then on to Central Tilba for some sight seeing. It certainly is a beautiful part of Australia. It was back to Jim and Janes for a few post show drinks and then off to the Bermagui pub for dinner. The "mega mixed grill" went down a treat. Sunday arrived and we prepared for the ride home. 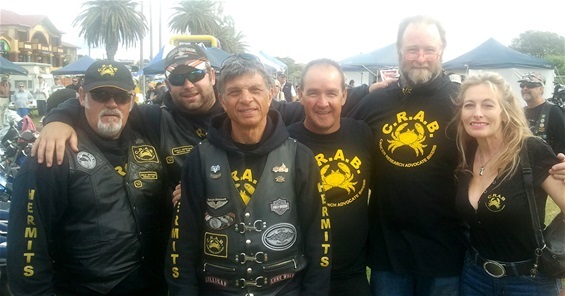 Steve, Rowan, Tony and Angelo were planning to do the trip in a day while Berni and myself decided to ride down the Snowy Mountains Hwy and then on to the Monaro Hwy through Bombala and on to Cann River and make it a two day ride home. After an absolutely fantastic ride across the roof top of Australia we made it to Lakes Entrance by mid afternoon. It was quite hot when we arrived so it was out of the riding gear, quick shower, into some shorts and thongs and then a pleasant stroll along the foreshore to Safeway to pick up some supplies and some bevs and as luck would have it our motel in Lakes was only a few doors from KFC..how about that! The next day we picked up a few brief showers around Bairnsdale but after the perfect weather we had had prevoiusly we couldn't complain. By the time we had passed Sale the weather was warm and sunny again. A quick lunch at the Lang Lang pub and then on to home where we were chastised by the cats and ducks for having the audacity to leave them. A great ride, a great show and great company....when's our next ride? Rest stop near the NSW borber. 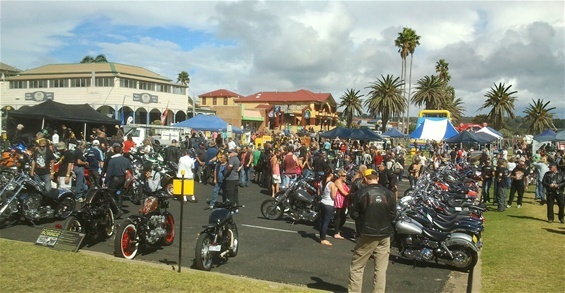 At the Bermagui Bike Show. The Monaro Hwy. approaching Cann River. The guys and gal enjoying the bike show. Saturday dawned as a magnificent morning on the Sapphire Coast. Ideal day for a bike show. For Steve, Angelo, Tractor & Ross the day was broken up by a ride out to Tilba for lunch at the pub (Don’t mention the steak to Tractor!) whilst Jimmy, Steve & Chris headed up to Batemans Bay. The band was in full swing, the judges made the hard decisions on the bikes (Tractor was robbed of a prize) & numerous other fundraising activities were happening. The boat raffle was drawn and all up around $20k was presented to Cancer Research. After a successful day and packing up everyone headed to the Pub for a fine feed & big night out.